When I was young, my mom taught me the difference between a magazine and a catalog. I called every glossy, book-like item that came in the mail a magazine, and she corrected me when that item was actually a multiple page advertisement for a store. Today I got four CATALOGS in the mail: William Sonoma, Pottery Barn Kids, West Elm and J. Crew. Normally, these would lay in a pile on the coffee table until getting recycled during a cleaning fit. This evening, I actually sat and leisurely paged through them all. (And, to those keeping track–probably only the hubs–it is not the same as my post about looking for a new magazine because these are catalogs). Highlights: William Sonoma’s smoothie recipes. Pottery Barn Kids’ chevron crib sheets that I wish they made in adult versions. West Elm’s rugs–chevron and ikat–and bold striped bedding. And J. Crew’s everything. Their new stuff is all amazing and I only wish I could afford it. One thing to work on, shopping J. Crew sales. 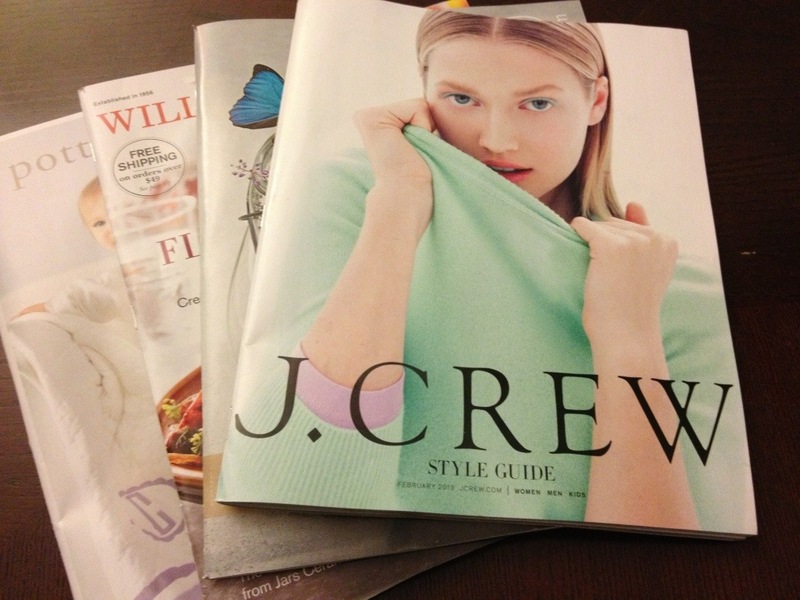 It was so relaxing to sit quietly, with a cuddly dog, and look at magazines–Catalogs! (I really typed magazines and had to correct myself. I left it in for my mom). Haha. I do remember that and I’m glad it made you smile!